As the most expensive board in our tests, the Republic of Gamers branded Crosshair V Formula has to pack a punch in every area. I found it surprisingly easy to test, and it comes with a good bundle in the box. For users wanting a little more of an experience from their product, ASUS also has dedicated forums to their ROG lineup so similar minded users can exchange setups, ideas, and read ASUS materials on how to get the most out of their system. Onboard, the use of an Intel NIC and the X-Fi 2 audio solution are big bonus points, which more than likely attribute to the price tag. The BIOS is also a good representation of what the BIOS should be, and we have it here garnished in Republic of Gamers’ flair. The AI Suite software too is a nicely packaged system well worth investigating if you own an ASUS board. If you want supreme control over your onboard fans, you will not do much better than having fun with the ASUS solution. I was a little disappointed with the overclocking scenario, with the Extreme function not being that much more than the Fast setting, and trying to push the processors, especially the Bulldozer, led to a certain amount of instability under heavy loads. Performance wise the board is no slouch as anyone would expect. However it does come in at under twice the price of the Biostar, so users will have to decide whether they want a system that just runs, or one that costs an extra $85 and the extra features will be used. You could do a lot worse than the Crosshair V Formula, but with the feature set it provides (NIC + Audio especially), the only thing that may hold you back is the price. If you have the cash to splash, this board ends up being a good part of any AMD build. 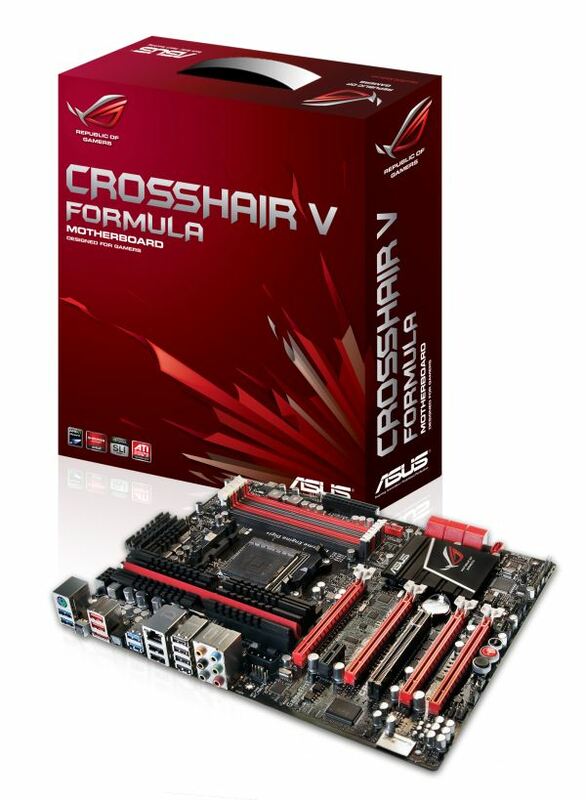 The main selling point of the ASUS Sabertooth range is a magical five-year warranty. With this in hand, ASUS are confident that their product will run and run and run. In order to preserve this warranty, the Sabertooth range gives options and software in order for users to customize their cooling capacity. The six fan headers on board, coupled with almost a dozen temperature sensors, are conjoined by the AI Suite software to allow the user to determine which fans are controlled by which sensors (or a combination therein), as well as the temperature ramp of each of the fans. This being said, the Sabertooth 990FX as a product actually runs very warm with a Bulldozer product in it. With the FX-8150, the overclocks were horrendously limited by the CPU temperature sensor going above 90 degrees Celsius, causing the processor to declock. However, with a Thuban processor, the board flew quite well with its overclock range, with more than one occasion suggesting that if more voltage had been applied than our standard testing, it would be perfectly stable and within a power envelope. Such is the difference between the processor families, and it seems that this Sabertooth is more optimized for Thuban than Bulldozer. At around $185, coupled with that warranty, the Sabertooth comes with what I would consider the bare minimum in the box – several SATA cables and a single SLI connector. In terms of on the board features, we are also treated to a Realtek NIC/Audio combination, and a lack of Power/Reset buttons on the product itself. Of the audio, the AI Suite software and its sensor control causes our DPC Latency test to spike by a factor 10x, so I would suggest users turn AI Suite off if they are dealing with sensitive audio work. The Sabertooth is a great board to have at stock or with a Thuban, and the level of customizability is nothing to be sniffed at. A lot of people will be happy with this board, and at the price at the time of writing, offers more than its competitors. A serious contender for a 990FX AMD system is right here. When you go through so many motherboards and motherboard reviews in a given space of time, the writers block runs high and the amount of adjectives (superlative or not) runs low. It is hard to describe how I exactly feel about this Gigabyte board. 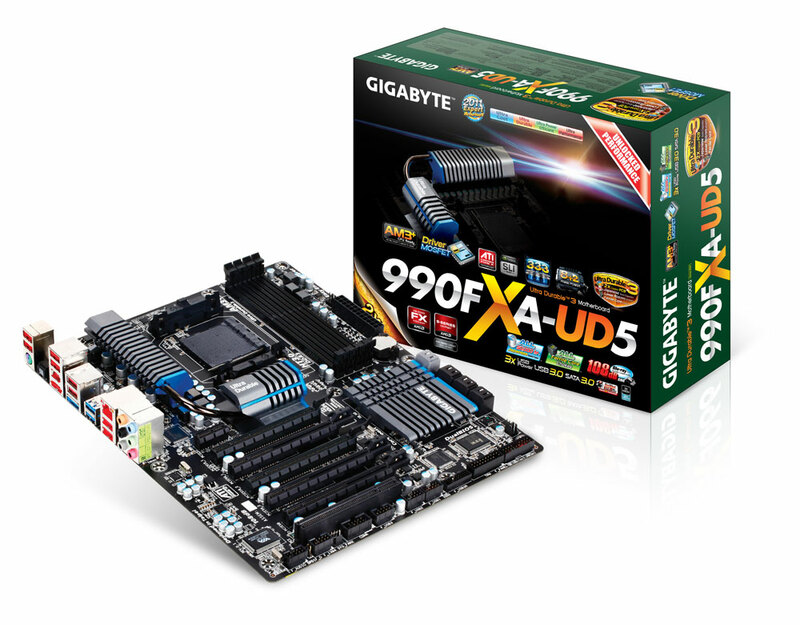 Gigabyte is a master of advertising, and by scraping together here and there, they can offer a seemingly better board in a lower price bracket. However this is the 990FXA-UD5, near the top of the 9-series range. So hopefully they should not be trying to compromise the user experience. When you read the specifications sheet and see a dual Realtek Audio/NIC combination, that is usually where it starts, and with an ALC 889 nonetheless. Despite the board I tested being an earlier version (with pronounced CPU voltage ripple), the later boards have the same functionality but it should all be tightened in a bit and a little more optimized. The main concern to note over the whole product was the temperature of the VRM heatsinks when under load (and overclocked). There seems to be a lot of heat under there, and when it reaches a certain temperature (in my case, when the X6-1100T CPU read 65ºC), the CPU will throttle down to preserve the life of the components. Some form of active cooling should have been employed if this was the case. Layout is a little flaky as well, with dual GPU users needing to put their GPUs together in order to maximize PCIe lane usage. Audio users will have to turn off the Gigabyte monitoring software to ensure that audio remains as smooth as possible. Fan controls, as with previous Gigabyte iterations, are not that fancy, with only one OS control for all the fan headers on the motherboard. For $180, the 990FXA-UD5 does come up a little short, and in my mind, it would be worth digging a little deeper into the pocket to pick up something else from the 9-series range.